Edifier’s TOSLINK to Mini TOSLINK Optical audio cable lets you connect our speakers to your sound system. Receive true high quality stunning sound with the use of Edifier’s optical cables. The TOSLINK optical audio cable from Edifier offers compressed 5.1 and 7.1-surround sound. Optimize your audio with Dolby Digital Plus or DTS-HD High Resolution Audio. The cable is 5 feet long so you don’t have to worry about not having enough cable. Originally, Toshiba created the TOSLINK cable so they can connect their CD players to receivers that they manufactured. The first version of the optical cable was created in 1983 and remains in production. The mini-TOSLINK is a smaller version of a regular TOSLINK connector. These are mostly used for large consumer audio equipment. 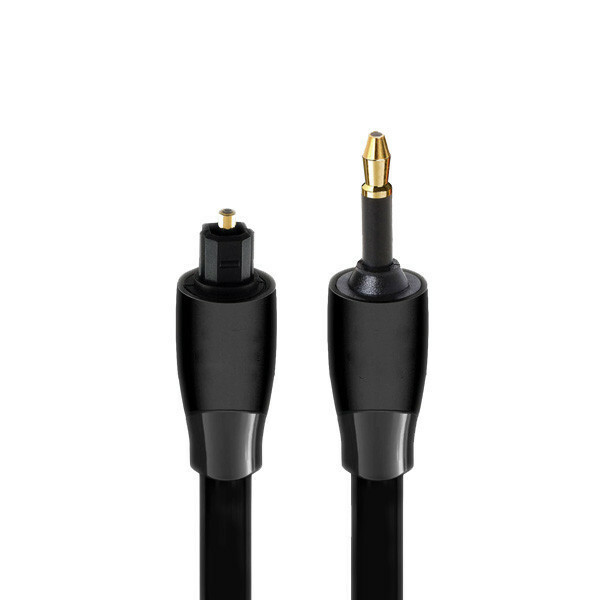 Mini-TOSLINK cables are used for laptop computers and portable audio equipment. The mini-TOSLINK to TOSLINK optical cables originally comes bundled with the e25HD Luna and e30 Spinnaker speakers making you able to connect your audio device to Edifier’s speakers. Connecting an optical cable from your TV or AV receiver to your Edifier speakers is an easy task. First remove the plastic covering that the optical cable has attached. Then plug in one side to Edifier’s speaker making sure that he inputs are aligned before inserting. Then plug in the other end to whichever device you want to plug Edifier’s speakers into.